The appartement was very Nice clean and great luminosity , calm, Nice View and we have visited every places by foot. People were very nice with us. You should buy 2 or 4 folding stools and have glasses for wine, and tea towels. We had a very pleasant stay. We love the stunning light, the perfect location and the lovely terrace. L'appartamento è in una posizione strategica...puoi raggiungere tutte le maggiori attrazioni in pochissimo tempo. The apartment we stayed in was fine and a reasonable value. When a problem arose with the elevator in the building I really did not think anything would happen. Sibilla was incredibly responsive and on top of the issue. I could not have been more impressed. We have rented from RomeLoft before and will do so again. While not the most lavishly appointed, the apartment is so centrally located to the old City and has the most wonderful patio it is well worth the stay! My only comment was that Roberto who met us at the site disclosed an addition fee that was was previously undisclosed. That was uncomfortable. It is in a perfect location, because you are next to everything. In general terms it is a nice place, but you should have in mind that the second room is too small without a window. The teracce is perfect with a spectacular view, especially for spring -summer months. thank you for asking feedback from us, location is wonderful, only problem is the cleaning, we stayed 5 days, may be for long stays more than 3 days you may put a cleaning service every3 days or 2 days, 5 days is a long period, towels and linens must be changed for such kind of a period, other things is okey, thank you very much for your service. 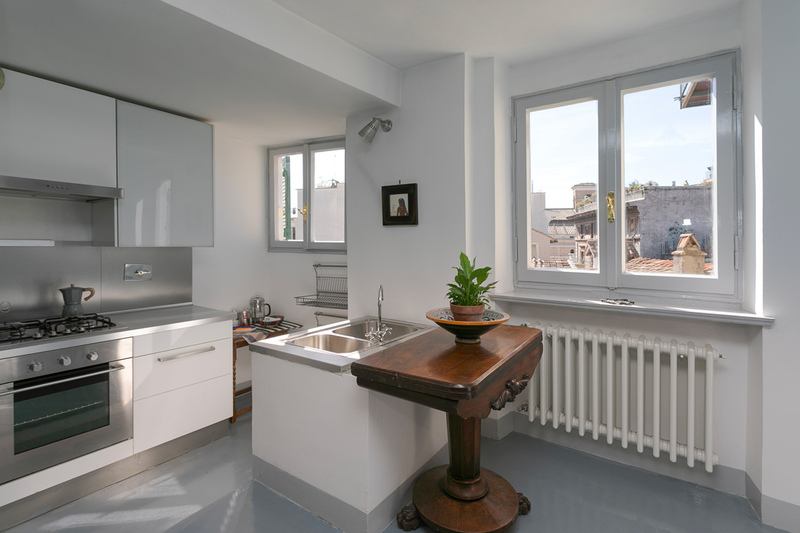 You will find this Campo de Fiori lovely apartment with terrace on the 5th floor of an eighteenth century building with a lift. The entrance leads you to the open concept dining room/kitchen. The dining area features an antique American table with chairs and a display cabinet. The kitchen has a gas stove, an oven, a fridge, a freezer, and all the necessary cooking equipment. These two areas are very welcoming after a long day of exploring. Why not cook up a delicious meal before putting your tired feet up and unwinding in the living area? 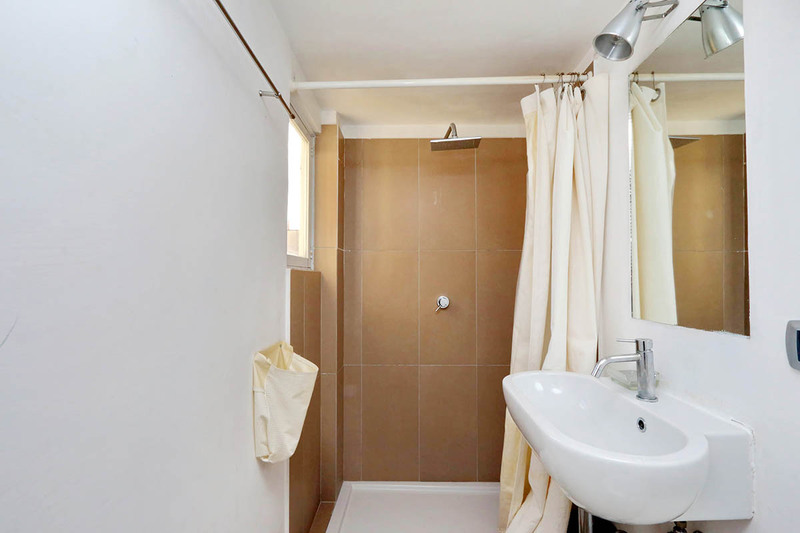 A small modern bathroom with a shower is to the right of the dining area. The first bedroom, although quite small in size, does offer a double size bed and closets. This room can sleep two adults but is better suited for children. 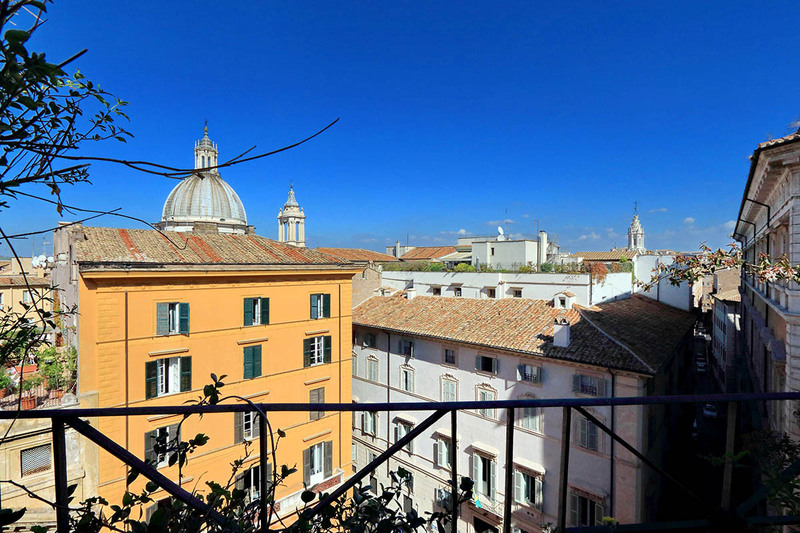 The living room overlooks a wonderful terrace with plants and views over the cupola of Sant’Agnese in Agone church. It features refined furniture: a comfy blue double sofa bed, an antique coffee table, wooden consoles, gilded wall appliqués, Chinese vases, and Sat TV. 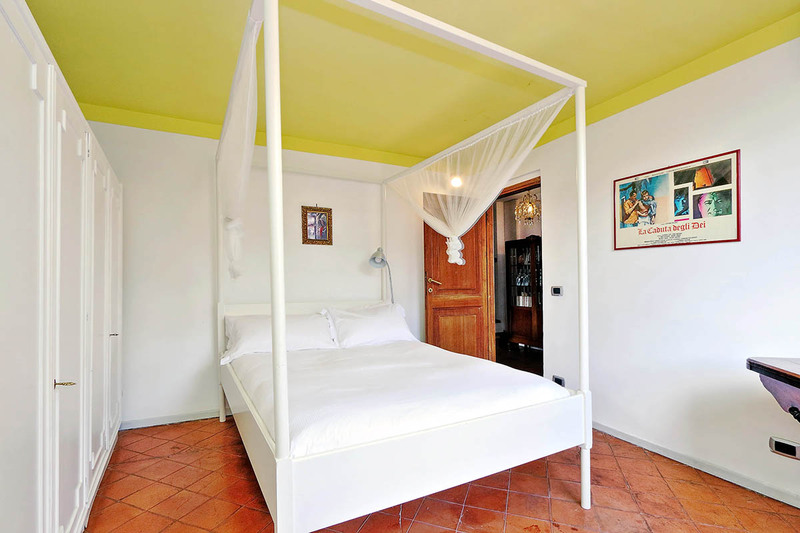 The second bedroom has a king size bed, an antique wooden decorated wardrobe, paintings, and a desk with a chair. 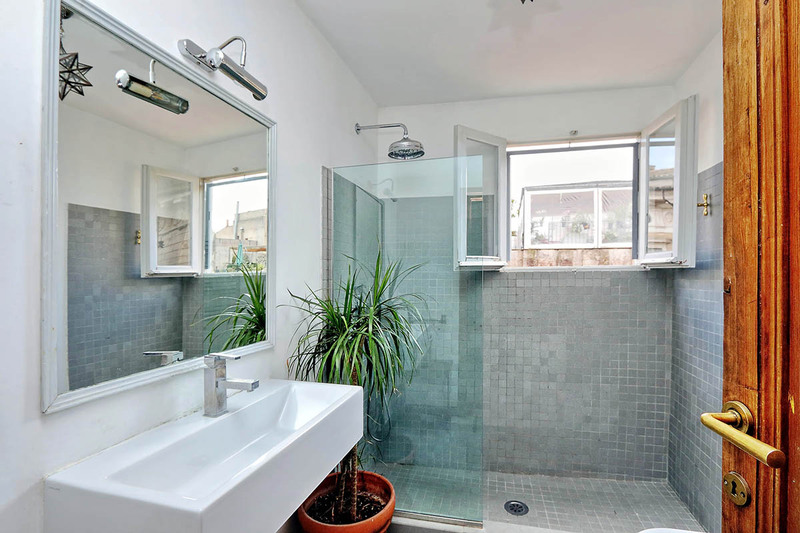 Next to the bedroom, you’ll find the second large bathroom with a shower. Finally, the apartment is also offers central heating and air conditioning. 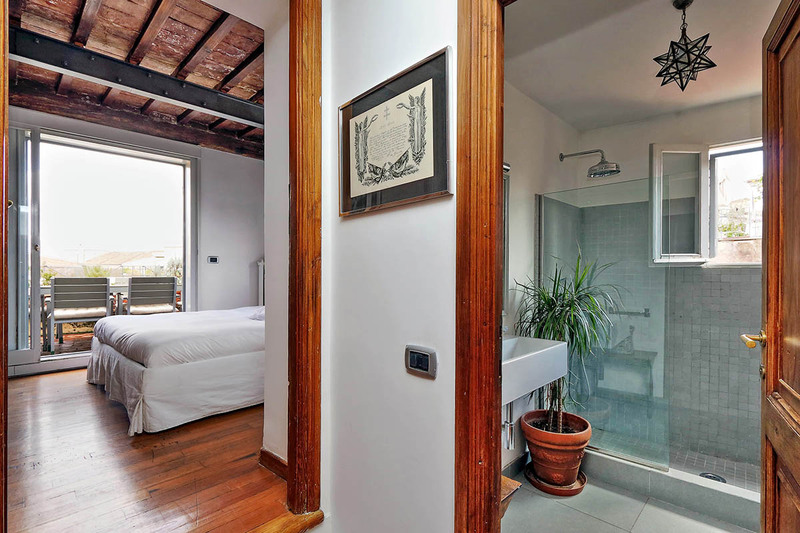 This Campo de Fiori lovely apartment provides guests with a splendid and a comfortable home, while giving them easy access to all the action of the neighboring streets and squares. 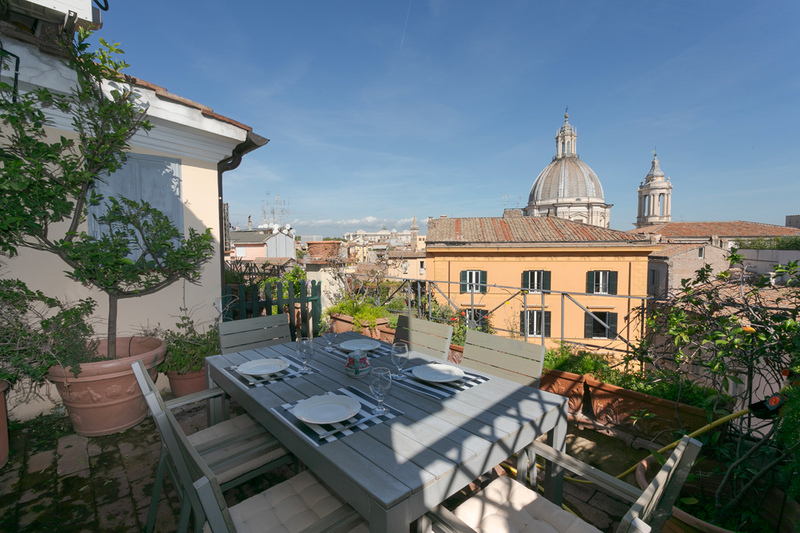 This apartment is walking distance from Piazza Navona and the Pantheon. From here, guests can easily access public transportation, as well as many of Rome’s best attractions. You will also find many savory restaurants, chic cafés, and trendy shops nearby! Don’t miss an Italian aperitivo at Campo de Fiori. This is a great place to be come evening, as it fills with people and energy. 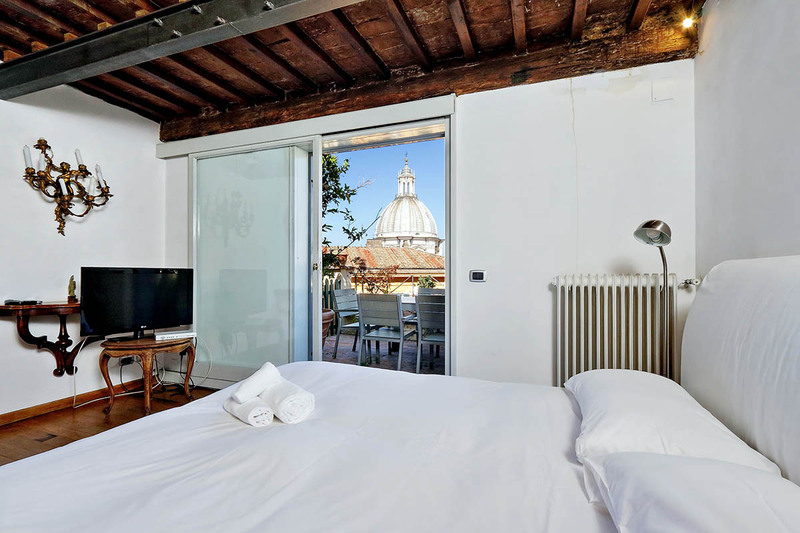 From your rental you will also be able to walk to such attractions as Trastevere, Castel Sant’Angelo, and the Jewish Quarter. In the latter you can taste some truly authentic Roman-Jewish cuisine at various restaurants. Head to Al Piperno for its traditional dessert ‘Palle di Nonno’. This restaurant has been going since 1860, ensuring a truly traditional cuisine and quality taste. The area around your apartment will also have many necessary amenities. For example, here you can find supermarkets, post offices, banks and pharmacies. We would also recommend the Campo de’ Fiori morning market. Here you can pick up some fresh produce with which you can cook up your own delicious meals! The location of the via Leutari apartment cannot be improved upon. There is wonderful food shopping in the Campo dei Fiori - a butcher, a norcineria, fruits and vegetables, and an excellent bakery nearby. It is possible to walk to many of Rome's major sites - and to stop in bars and cafes for coffees and light snacks. There are also many good ...Read Morerestaurants and wine bars very nearby. The Cinema Farnese screens occasional movies in English. The staff at Rome Loft is attentive and helpful. We were very happy with the apartment. It suited us as a couple with adult sons( who didn't mind sharing the second bed for a couple of. nights) The location is perfect . 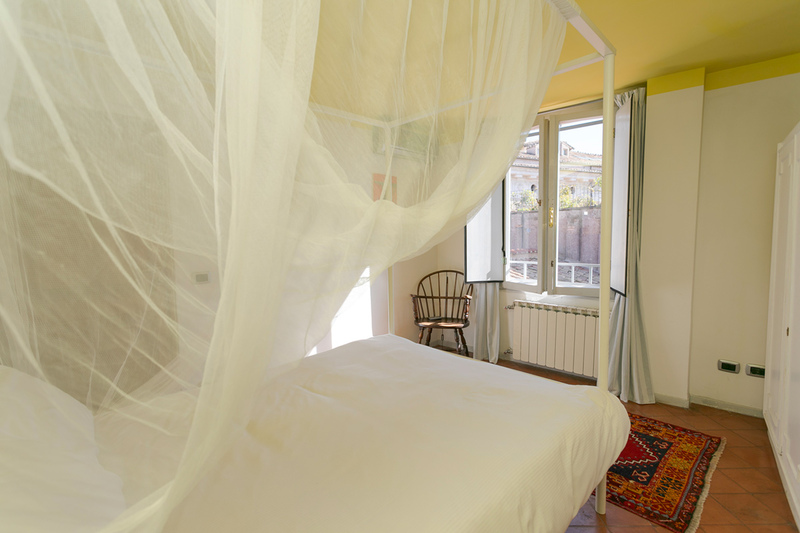 Situated in a small lively square just around the corner from Piazza Narvona.Its on the 5 th floor accessed by a small quaint lift. As you open the door there is a small sit...Read Moreting area with a small bathroom on the right. a step down into the kitchen then a step down again into a small room adjacent to the bathroom.this is where the pictures on the site are incorrect because the verandah is accessed from the main bedroom.it wasn't a problem but it looks very differnt to the pictures advertised.When you exit the from doro you can turn left for via Victor Emanuelle and bus stops going in either the Vatican to the right or across the road to termini. If you turn right out the front door you are in Piazza Pasquale and left to the supermarket.there are great eateries all around and the supermarket sells all manner of cold meats cheese and wine perfect for a verandah dinner.the views are wonderful All in all we had a very pleasant experience and would return to this apartment just for its fabulous location. This apartment could not have been better! The location was perfect! We walked to everything - the Spanish Steps (0.8 mi), the Vatican (1.4 mi), the Colosseum (1.4 mi), and Trastevere (0.6 mi). It was literally right around the block from Piazza Navona and the Pantheon. The apartment was perfect and large!!! There is a lovely terrace! The onl...Read Morey bad thing is that there are several single steps throughout the apartment (that you don't expect and that are hard to see) -and if you are clumsy (like me), it can be dangerous. Overall, we give this apt 5 stars on everything! L'appartement est très agréable grace à sa terrasse et sa situation dans Rome. A notre arrivée, notre correspondant a été très efficace, l'appartement était propre. Les enfants n'ont pas dormi dans la trop petite chambre mais sur le canapé du salon, car il y avait la climatisation. Mais l'appartement est suffisant grand...Read More pour nous 4. Il a un vrai cachet. Nous avons profité largement de la terrase, nous y avons mangé tous les repas. L'équipement est complet, même si nous n'avons pas pu utilisé le four (problème d'électricité). Bref nous recommandons vivement. Location was fantastic. Taxi stand one block away. Very short walk to both the Campo and Piazza Navona. Living room and one bedroom air-conditioned. Temperature and apartment was tolerable. Elevator was not working on our day of arrival and the walk was terrible, certainly not suited for older people-steeply winding stairs with a few handrails. Ter...Read Morerace door very difficult to open and close. That said, we would certainly go back to that apartment. This is indeed a lovely apartment! 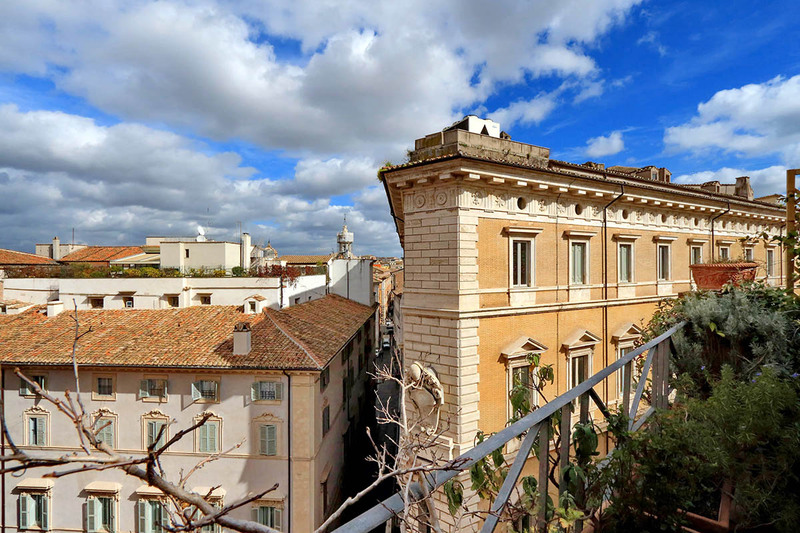 Fantastic location (yet quiet), well-appointed, and with an absolutely sensational large terrace with a view of the roofs of Rome and Sant' Agnese in Agone. We had breakfast and dinner there every day for a week. 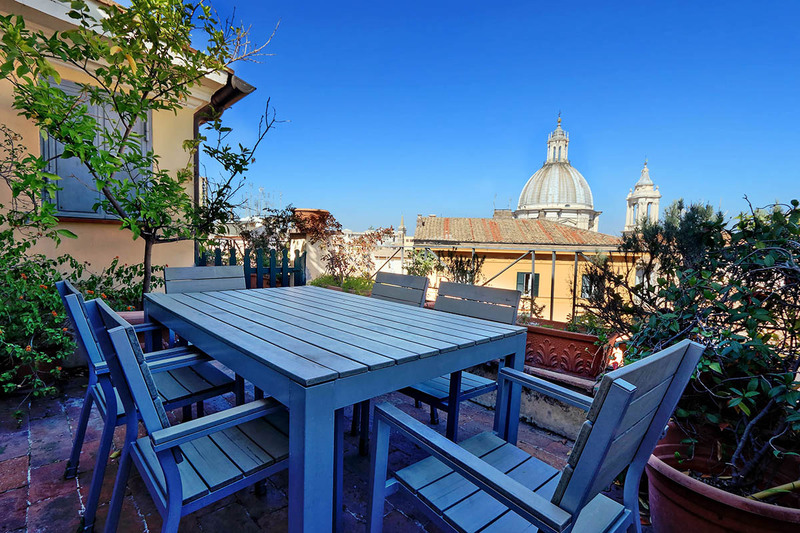 This apartment is 3 minutes from Piazza Novona, 3 minutes from Campo dei Fiori, about 7 minutes t...Read Moreo the Pantheon, and also very close to major bus routes and taxi stands. There are lovely cafes and bars nearby (try Emporio alla Pace), great pizza (Forno Campo de' Fiori), groceries and of course remarkable sites on every corner. RomeLoft is excellent to work with - the communication is first rate, as is the quality of their apartments (I have stayed with them before). Honey is a total professional, great at explaining how everything works, and very quick to respond if you have any questions or need anything after check-in. Highly recommended! Four of us spent 4 nights in this well-located apartment. 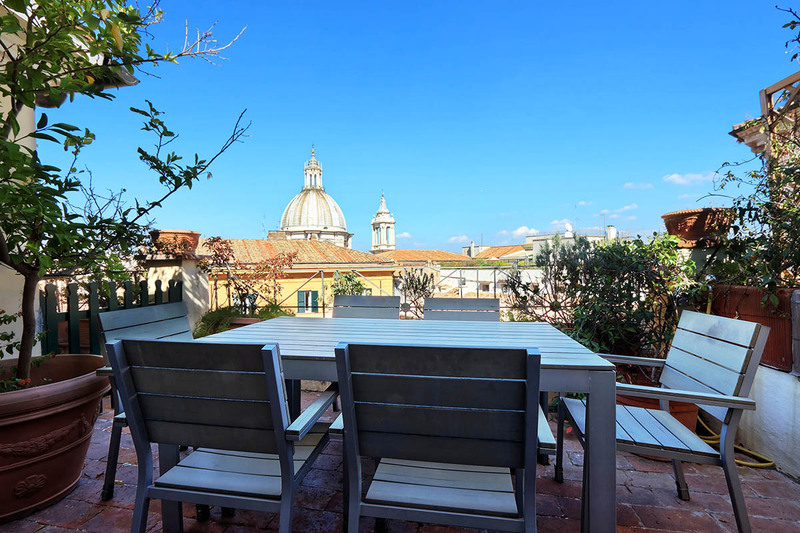 Tucked behind Piazza Navona, the location was ideal - really close to some delicious restaurants and great bars, plus in walking distance to the Vatican and lots of the major sites. The apartment was well equipped - a nice kitchen and living room and one huge double bedroom. The second b...Read Moreedroom was quite small but ok for our needs. There's lots of storage in the main bedroom but the 2nd room possibly better for a single person or 2 children. The terrace was terrific, we loved sitting out there every evening! Bathrooms both were pretty good, well equipped and clean. 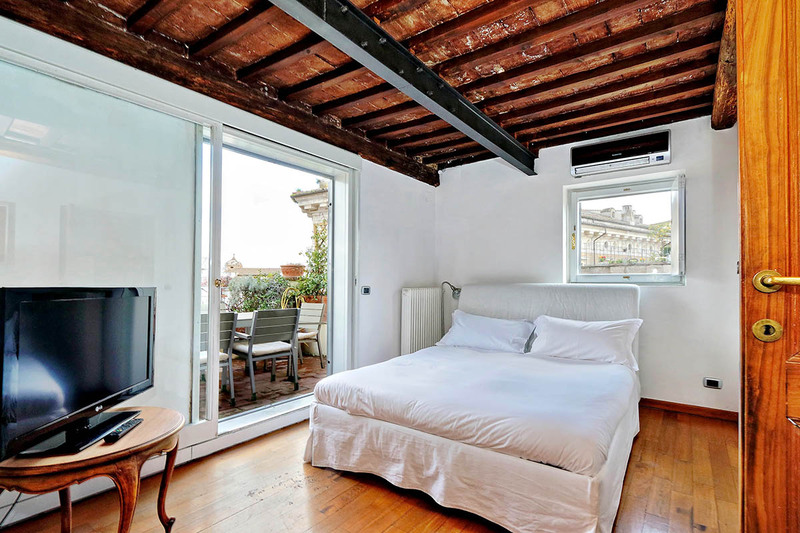 Rome Loft were great, picked us up from the airport and ensured our check in was quick and efficient. Really loved our time with them in Rome and would definitely do it again! 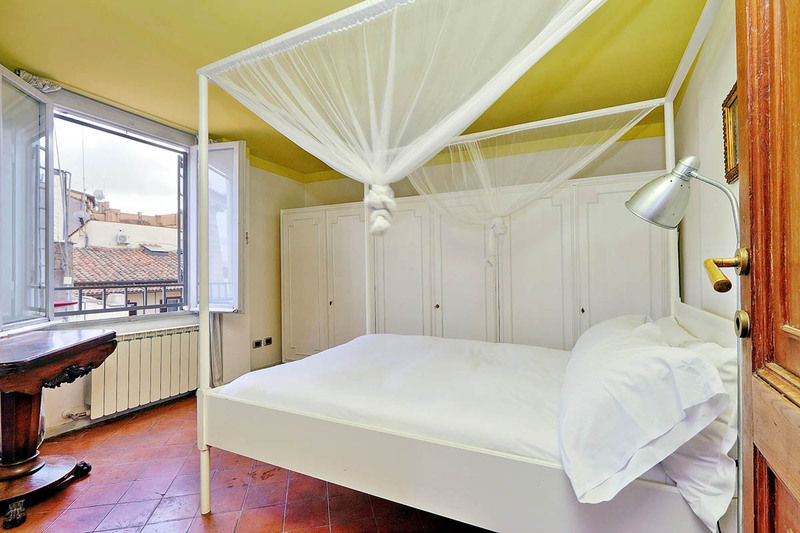 The Campo dei Fiori lovely apartment is amazing. I would stay here again in a heartbeat. Watching the birds fly around the terrace among the roofs and domes was so hypnotizing it was hard to leave, but once we tore ourselves away, all of the best parts of Rome were at our fingertips. Great shops and restaurants abound just around the corner, Piazza...Read More Navona and Campo dei Fiori are a stone's throw away, and Trastevere and the Vatican are not much farther. 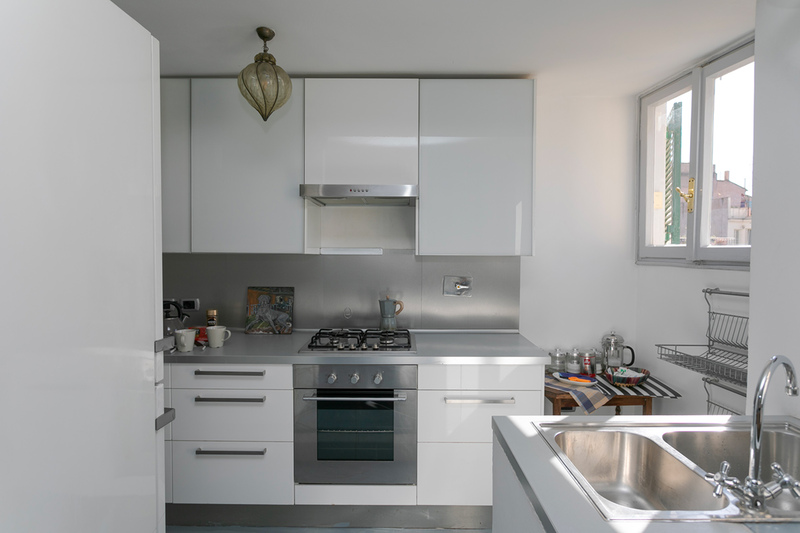 The apartment itself is spacious and comfortable with lots of well-equipped kitchen space for those who like to cook. Wi-fi worked perfectly the whole time. The only issue was the lift, which worked about every other day, but we welcomed the exercise walking up all those stairs after eating so much pizza and gelato. We could not have chosen a better place to stay. 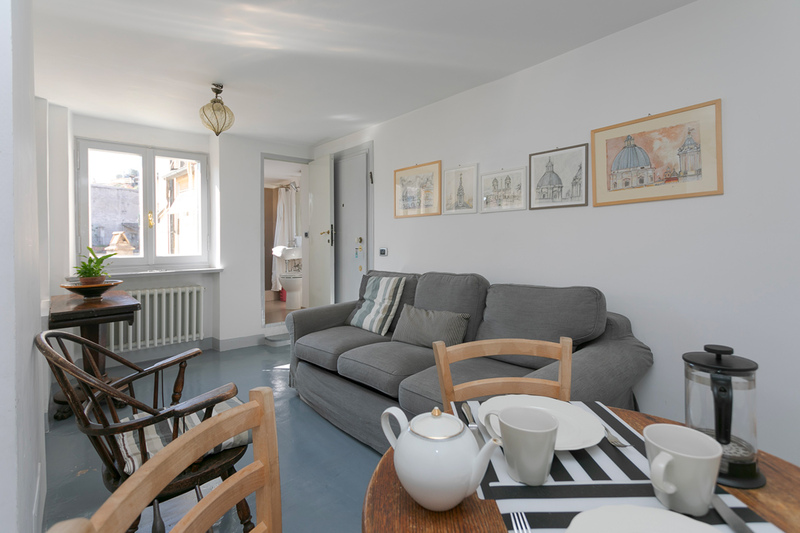 central,cosy and really enjoyed our stay.oneof th edouble rooms is quite small but plenty of storage on the other rooms.Showers lovely and warm and location couldn't eb better.Would go with Rome loft again,very accomodating to our needs. Fantastic apartment and brilliant service. Would highly recommend RomeLofts and this apartment.